How did an ordinary toy brick, invented in the 1940s in the workshop of a Danish carpenter, become a toy-industry powerhouse with a fanatical global following? 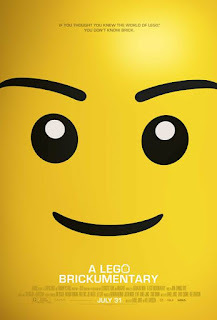 We're talking about Lego, the subject of A LEGO BRICKUMENTARY, an exhaustive documentary about “a simple toy that became more than a toy,” in the words of the film's narrator, an animated Lego figure charmingly voiced by Jason Bateman. The film chronicles, with a mix of awe and jocularity, the rise of this humble toy brick to the toy industry's “greatest success story,” and a medium that continues to inspire not only kids but architects, engineers, designers, scientists, filmmakers, architects and artists. We are taken to Lego conventions, which rival Comic cons and Star Trek conventions for the enthusiasm of its followers, whose creativity in building stunning and functional Lego assemblages – one woman is shown with her prize-winning, room-size Lord of the Rings diorama — rivals the company's own “master builders,” many of whom themselves started as fans. According to Lego lingo, grown-up Lego enthusiasts are AFOLs — adult fans of Lego (contrasted with AHOLs, Adult Hobbyists of Lego, and ALEs, Adult Lego Enthusiasts, who eschew the term “fan.”). They include such eminences as South Park co-creator Trey Parker, who calls Lego “therapeutic,” and the Houston Rockets center Dwight Howard, whom we see being surprised by Ellen DeGeneres with a life-size Lego bust of himself. Amid the many colorful and amusing examples of the use of Lego – characters (the Steven Hawking is one of the more amusing), stop-motion re-creations of famous film scenes, skyscraper models, a working roller coaster, an operating car, a life-size dog — is talk about Lego that is almost metaphysical. Lego is “infinitely flexible,” “finite but also infinite,” “a creative tool, a medium, a language.” It's a path to enlightenment, a cure for psychic ailments, an international goodwill ambassador. A psychologist discovered that autistic children, working on Lego projects in small groups, improved their communication skills. Nathan Sawaya quit his corporate law practice to devote himself to making fine Lego art, and we seem him preparing for his debut exhibition in New York. In Germany, artist Jan Vormann engages in street art known as “patchwork” or “Lego bombing,” using colorful Lego bricks to “patch” crumbling buildings, adding a hint of cheer to a decaying landscape. With its relentless promotion of the Lego brand, the film has the tone of a company recruitment video or a film you'd see on continuous play at a Lego theme park. Even so, directors Kief Davidson and Daniel Junge, who wrote the script with Davis Coombe, bring a wry, self-effacing tone to the proceedings that makes the PR palatable. Though rather lengthy for the subject matter, it's a kinetic, brightly colored visual trip that will certainly please Lego fans as well as provide insight for the merely brick-curious. 3 1/2 out of 4 stars.